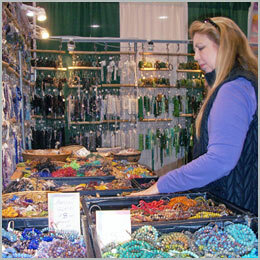 March 13th – 17th, 2013 is the Santa Fe Bead Fest! This is a great Santa Fe event to take-in while a guest at Casa Escondida Bed & Breakfast. Casa Escondida B&B is a Santa Fe area B&B, located in historic Chimayo, NM (just 35 minutes north of Santa Fe, on the High Road to Taos). The Santa Fe Bead Fest is so much more than just a bead show. 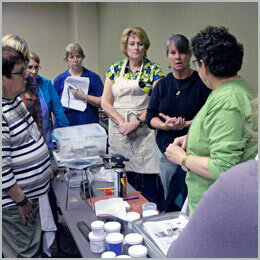 It allows you to immerse yourself in every element of beading and jewelry making. This Santa Fe bead and jewelry event is being held at the Santa Fe Convention Center! Take-in beading classes, free demonstrations, over 95 different jewelry-making workshops, book signings, buy supplies and visit with over 150 exhibitors. Whether you are interested in bead stringing, bead embroidery, wire wrapping, wire weaving, metalsmithing, torch enameling, mixed materials, chain maille, metal, clay, macramé (and MUCH more), you will find classes and vendors for you! The entry fee is only $12 for a 4-day pass. There is even a $3 off coupon available or you can simply pay $15 at the door. Of course, workshops require an additional fee (workshop per-registration is required). Casa Escondida B&B has wonderful guest rooms available during this event. PLUS we are offering Bead Fest attendees a 10% room discount! A full, breakfast is included. Parking at Casa Escondida B&B is FREE. We look forward to having you as our guest. Happy beading!